A family-oriented adaption of James Fenimore Cooper's "The Last of the Mohicans." 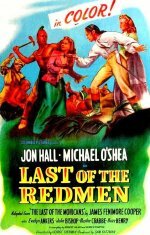 As the French-Indian War rages across the untamed territory of the Great Northwest, the embattled wilderness gives birth to a legend, the proud legend of "The Last of the Red Men." August, 1757, General Montcalm and his Iroquois allies are on the war path, and General Munro fears for the lives of his children as they travel to join him at Fort William Henry. Although Munro dispatches a letter urging them to take refuge at Fort Edward until the road is safe, an Iroquois scout intercepts the warning. So Major Duncan Hayward, handsomely portrayed by Jon Hall, is unaware of the danger as he escorts Alice Munro (Evelyn Ankers), her sister Cora (Julie Bishop), and her young brother Davy (Buzz Henry) from the sanctuary of the fort. When their guide Magua, a vengeful Iroquois played by Buster Crabbe, betrays them, only one man can save the travelers from his savage trap. Starring Jon Hall and Michael O'Shea.